I like this app a lot. Very useful info and easy to use. Can bookmark, share & even email them to yourself for print out. 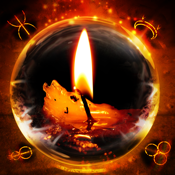 I have been a witch for over 13 years and I have to say that this app has been a blessing!! I love it!!! It's amazing!!!! I've learned a few new things and the only thing is that I would like to see new spells but over all.... 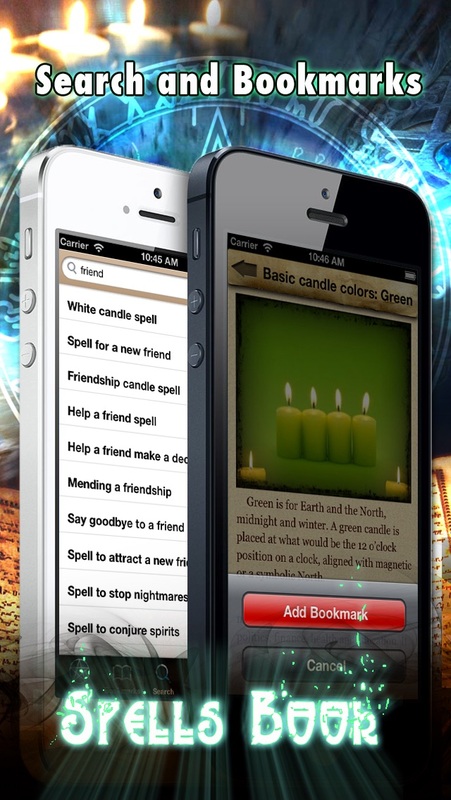 I can't live without my Witchy app. "Blessed Be"
It has everything I need in it. Okay, I'm not a pro at this kind of stuff, and I might be kind of young, but everyone needs to read this. I've been thinking about this, and I decided it isn't that bad or dangerous if you're heart is in the right place. If you don't want to download this just because of religion, read further. The bible mentions Egyptian magicians, so that proves magic is real AND that it is ok to use this because that magic is based of a religion and it worked. Plus, if God didn't want us to use this app, he would have done something like cause a worldwide glitch where nobody could get this app. So, you should get this app but be careful with it. I may not know much about Wiccan things, but I know my witchcraft. The misspellings and grammar errors make this look very unprofessional. 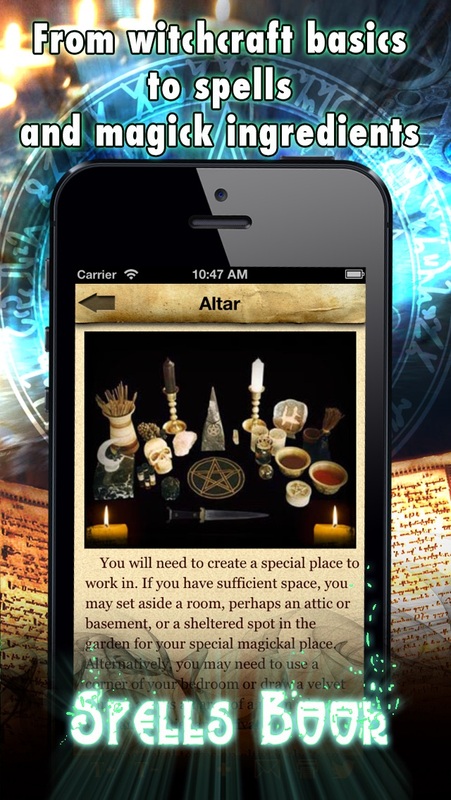 As a solitary practitioner and witch in training, I have to say that this app is very helpful. It helps for me to read the smaller articles on the go, which then makes them easier to commit to memory. All together a very helpful app with a few things that seem off- the sheer amount of love-related spells is a bit off-putting. Granted, love spells are what sells, but I personally would appreciate more information on other topics like the uses of herbs and stones. I really do like this app it's very informative however I noticed that under the Sabbats and Esbats portion it lists incorrect dates for the full moon Esbats. For example it states that the full moon for March is on the 8th yet the moon is actually a waning crescent. Other then that one way off thing I love this app. As a new person to magick this app is informative and helpful. I was looking for something as a reference to use ~ and this is fabulous! Worth much more than I paid and will serve as a great tool to my life. As a young Wiccan in training this is a very useful spell book to work with and a very useful reference guide for any Wiccan. Please fix this bug.The app fails top open. You click on it and it comes up & closes immediately. It has been this way for months. Right now I would not recommend this to anyone. Can not give a good review when I can't use your app. This app is great! It has a lot of information. I'm just starting out so I'm doing a lot of research and this was very helpful! Well worth the money! Was a good app previously, wish it had a list of symbols though. Some spells to get started with until one is more comfortable making their own. Latest version though crashes. It's completely useless. Sad day for me. This is an incredible app for those who are learning or just curious about the craft. Its remarkably easy to use and a great guide for references. I highly recommend this app for those who are looking to learn and grow spiritually. I love this app, it has so much information, and it is all so well organized. It is my go-to app wen searching for new spells, because it has so many. I haven't run into any glitches, and the information is accurate and wry helpful. I love this app, its so amazing. This app is the most info ive found in one place. Info is all available ofline aswell. A black version would be interesting and scary. As the title states i am a beginner and of course want to know do these spells work. It might just be because my power is low, but the app keeps crashing when I try to open it. This app is the best! While searching for witchcraft apps, I found this, and I'm glad I did! 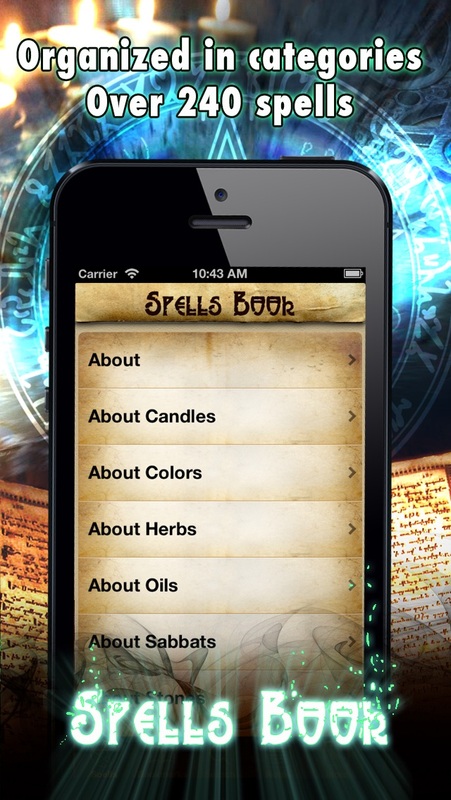 Look no further for your spells and potions; this app has it all! It's very easy to use and there's a spell for everything. (note to editor) you made a wonderful and useful app. ******im having some issues with notes. Every time I try to make a note my keyboard and the cursor won't come up even when I hit edit. **** also if you can add a dictionary for some some of the ingredients needed, with pictures and possibly a place where you can buy them this app would be perfect. I LOVE this, app! it makes a good mini BOS when I can't take the big book with me, but I've been having the problem of when I open it, the app goes into the about section, then when I try to go into the main spot before that, it kicks me out. I like this app, please fix and I'll regurn your stars! Many topics easy to read, follow, and uses different material that are bought easily. I recommend this App, and never crashes. Informative with many spells to choose from. Disruptions about stones, herbs, oils ect. with pictures as well. 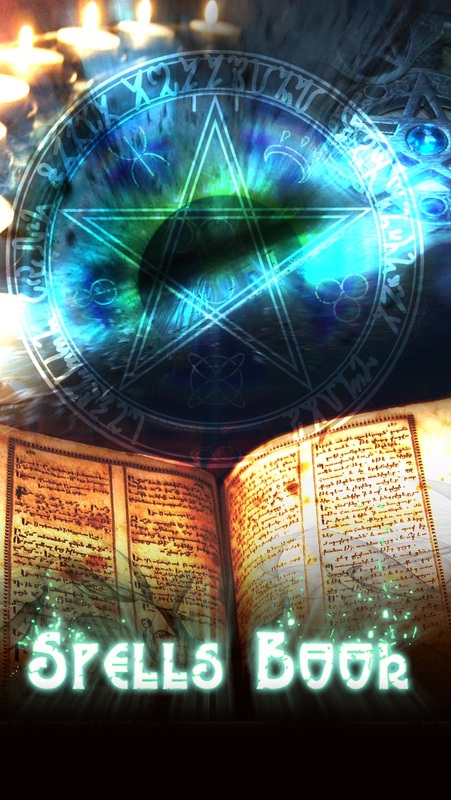 Spell ingredients aren't too complicated to obtain in order to execute a successful spell and much more. All in one spot & on the go! Love the art/design. Overall, I can't do without this app! Awesome! Best Spellbook App hands down! I bought the App, but I have not been able to open yet. It crashes every time I try. I contacted customer support, but I have not found a solution yet. I just love learning about all the different things that this app provides. A crown of an app, I thoroughly read this amazing book day and night, worth it!! This app has a bit of everything, and then some. Great for starting a BOS or just learning some basics. Searching, bookmarking, and adding your own notes, plus the abundance of categories and information make this my #1 choice for spell apps. This app is a nice reference that you can access quickly. Easy to use and informative, I find that this is one of the best apps(for this particular subject) . I really enjoy it and its given me things to try out and work on. This app has everything you need in one place. Very nice app! Very useful app, good information. I've not had any issues. I'm not giving it a 5 because nothing is perfect. The developers of this app are empathetic and responsive. They seem to care about the needs of their customers. 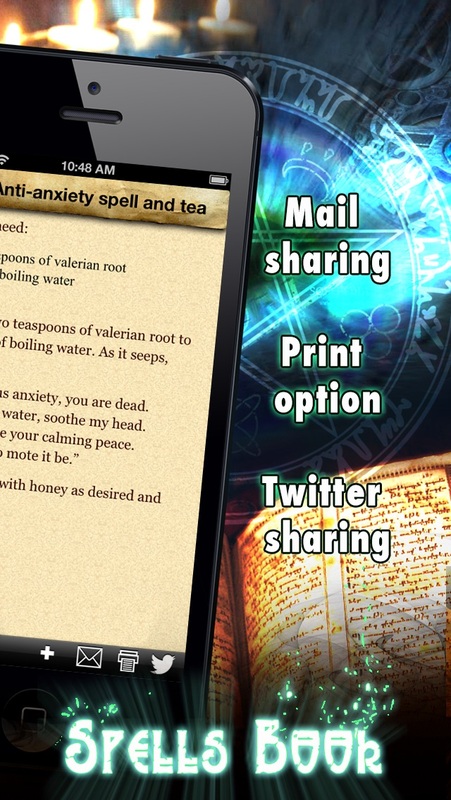 App has loads of information and spells to use. I like the idea that it can be used discreetly in any setting. I think that the photo used before with the pentagram and old book or a candle should be put back. For some, it's about ambiance. Very useful for daily life! Pretty unhappy that the app immediately crashes. I paid for it, and would like to use it. It was one of my favorites until I upgraded it. Then it started crashing immediately upon opening. Hope it gets fixed soon. Like it. good for a quick reference and generic enough for alot of forms of practice. I can't read anything, every time I try to the app closes.